When it comes to finding the right roll off dumpster rental prices, sizes, company for Bettendorf, Iowa you’re looking in the right place. Landrum Disposal has served Bettendorf customers since 2001. We’re located right here in beautiful Bettendorf, so our service is both prompt and reliable. We pride ourselves on being a customer driven waste services company that concentrates on providing the highest quality service possible regardless of the size of the customer. We concentrate on residential and small contractors for our roll off rental in the area and have served tens of thousands of customers over the years throughout the Quad City area. Our bins come in booth small and large sizes and are shown on the web site complete with actual photos to enable you to get a good idea of which equipment best fits your needs. What type of waste will you be putting in the container? Where do you want the container placed at your location? When do you need the container delivered? These questions need to be answered by the customer to ensure a smooth waste removal process, so lets look at each of them. What city are you located in? Or better yet, what is the address you’ll need the dumpster delivered to? We charge different haul rates for some of the outlying cities in the area, so to accurately quote you a haul rate, we need to know the city your waste is located in. We serve six counties and literally hundreds of cities in Illinois and Iowa, but we can usually give you an instant dumpster price for any city within our service area. What type of waste will you be disposing of in the container? This question is asked for a few different reasons. First, there are several waste items that cannot be disposed of in a landfill. Yard waste, tires, appliances, liquids, chemicals, etc are just a few items that will cause a load to be rejected at the landfill. Secondly, many waste are quite heavy and can’t be transported in large quantities without overloading the truck. Dirt, asphalt, concrete, brick, shingles for example need to be placed in smaller 10 yard roll offs and not the larger 30 yard boxes to avoid overweight fines and accidents arising out of excessive weight. Where do you want the container placed at your location? Waste bins are large metal objects that require a large, hard, level surface for placement. Study driveways, parking lots, gravel areas, etc are possible bin locations. Some cities allow bins to be placed on side roads if parking is available and allowed. We can usually be of assistance in determining if your city allows equipment to be placed temporarily on a public street. Additionally, our friendly drivers can be of assistance in helping customers with bin placement options when on-site. When do you want your roll off delivered? If you’re starting project that will require instant filling of a box, you might want the roll off delivered the day prior to the project being started. This will ensure the bin is available when you need it. Our daily rental fees are reasonable, so one or two additional days of rent shouldn’t break your project’s budget. We don’t provide several of the services that our competitors provide because we like to focus on a few things and ensure we’re doing those things right. But we do haul demolition and construction debris, recycle wood and concrete where these materials are separated. We’re always seeking to minimize waste taken to area landfills by looking for materials that can be recycled. Metal recycling is one of the more profitable endeavors a waste generator can engage in. If you’re planning on generation a large quantity of metal, we’re interested in hauling it to a metal processor. The City of Bettendorf provides weekly curbside waste collection for its residents living in single-family dwellings and some residents residing in multi-family dwellings. In addition to automated garbage collection, the City also collects bulky waste, appliances, and yard waste. Under the All In One program, the city collects co-mingled recyclables curbside in plastic carts from its residents. Some of the Bettendorf residents opt to have every other week garbage collection or smaller carts to save money on their quarterly waste bills. Commercial waste collection in Bettendorf is performed by the private sector. Rear loading and front loading trash trucks empty bins in alleys and behind commercial businesses on a scheduled basis. These arrangements are set up directly through waste haulers and business owners typically on a several year basis. Temporary roll off service is provided by private companies in the City. The equipment delivered under these arrangements usually sits at residential sites or construction sites for a short term basis. The waste generated through the above activities is usually disposed of at the Scott Area Landfill or any of the two privately operated landfills on the other side of the river. Renting a waste management roll off dumpster in Bettendorf, Iowa has never been easier, but you’ll need to consider a few things before the process agains. Some of those things are common sense for some folks, but let’s go through them step by step for those who haven’t rented a roll off container before. Determining the volume of waste, debris, junk you’ll be wanting to toss away is the first thing you might want to think through. This is important because dumpster sizes are plentiful beginning with 6 cubic yards continuing through 30 cubic yards or even larger. Now once you’ve figured out what you want to toss away, you’ll need to think of the pile of debris in terms of cubic yards as roll offs are referred to in cubic yards. A cubic yard is 36” X 36” X 36” or 27 cubic feet. You can think of a pickup truck with a 6’ bird being able to haul 2 cubic yards of waste at one time. So as an example, a 20 cubic yard roll off can hold roughly 10 pickup truck loads of debris.In addition to needing to determine the amount of waste you will have, you’ll also need to give some thought to what type of waste you intend to generate with your project. maybe you’re gutting a commercial building and will have materials like dry wall, concrete, fluorescent light bulbs, etc. Well the dry wall can easily be deposited in a rented dumpster, but the fluorescent bulbs are considered a hazardous waste and can not be landfilled. The concrete can be landfilled, but can not be hauled in large quantities. So if you just plan on tossing out a yard or two of the concrete, it can go into the same dumpster as the drywall. But if you have significant quantities of concrete, you’ll need to get a separate and small dumpster to prevent the overloading of the collection trucks. The good news is that, if you keep it clean, you can save money by having the concrete recycled. When do you need to have the roll off container delivered to your location? Now you don’t want to have the equipment delivered too early as this might cause you to incur unnecessary daily rental. On the other hand, if you intend to start loading your trash bin early on a Friday morning, you might want to have it delivered on a Thursday. We can not always promise an exact time of day for delivery, but we can promise to have your dumpster delivered to Bettendorf, Iowa on a particular day. Bottom line is that having your bin delivered a day oil advance ensures that it’s there when you want to start loading it. Finding and evaluating the local waste management dumpster rental company in Bettendorf is a necessary step. Maybe you have a friend, neighbor, favorite contractor who you can ask about the local trash haulers. You could always dust off the phone book and look in it for garbage collection companies, if you can find that book/directory. And then there’s the internet- A place to find both local garbage collection companies, nation wide waste giants, and internet waste brokers.Bettendorf, Iowa has some nation-wide waste companies who serve residential and commercial accounts in the area. They generally do a good job with large accounts, but might not bend over backwards to assist a one-time dumpster rental customer. Also, you might have to phone an out-of-town call center and explain to them a whole bunch of times whee you live to get a bin ordered. The internet brokers are pretty much a waste of time and money- They don’t have the trucks or dumpsters to fill your order. So they pretty much take orders from folks who believe they’re dealing with a local company, tack on a whole lot of money to the local dumpster price, and then subcontract the delivery to a local garbage collection company. The problem, in addition to paying an unnecessary middle man fee, is that your specific requests often get lost in the interaction and you don’t get exactly what you have originally asked for. ( i.e. delivery time, correct size bin, correct on-site placement of the bin, etc)So then theres the local Bettendorf, Iowa dumpster rental companies. These are the folks, like Landrum Disposal, who have served your city for years, employ local drivers, have the right size dumpster rental for you. And as an added bonus, when you order a trash container from them, your money gets recirculated back into the community in which you live, creating prosperity for all. Haul rate is the charge you’ll be assessed each time your roll off bin is emptied. You might want to consider this when determining the size bin you order as you’ll want to get the right size from the start to minimize the number of haul rates you’re charged. 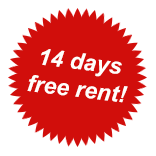 Daily rental charge is the charge levied for keeping equipment for an extended period of time. That period of time should be discussed and understood when you order the bin as some companies offer longer periods of rent free usage than others. Excess tonnage fee is the charge for the weight of the debris, if any, in excess of a pre-determined threshold. Again, this per-ton fee and the threshold should be discusses at the time the order is placed. And finally, there are the miscellaneous charges that some companies use to line their pockets like administrative fees, fuel surcharges, environmental fees, etc. I don’t like them, you don’t like them, but they’re a part of life at this time with some of the larger companies. It’s just important that you understand what you’re getting into before you rent a dumpster in Bettendorf, Iowa.